Want to prepare your kids for the coming summer as they run around the garden, having some fun with water pistols and the like? Well, there is a spanking new Super Soaker Scatter Blast that might just make your little ones more than happy – after all, who doesn’t want to be top dog in the neighborhood? 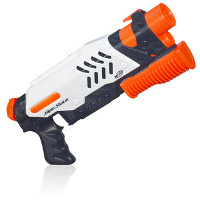 Available to pre-order where it will ship from the beginning of next month onwards, the Super Soaker Scatter Blast will retail for £12.99 and can blast up to 5 streams simultaneously – that ought to prevent anyone from ambushing you without suffering from any consequences. Of course, adults too, could have some fun with the Super Soaker Scatter Blast, as they have some couple fun to cool down during those sweltering summers. Just make sure you have enough energy left at the end of the day to slide the pump forward to load the chambers, pulling back to fire at your opponents. With such a potent tool in your hands, you surely cannot miss no matter how bad your aim is!